As we all know food waste is a massive problem in the UK and one of the main contributors is unfortunately from suppliers in the FMCG industry. In 2016, 1.9 million tonnes of food was wasted by suppliers and, of that, 250,000 tonnes was still edible (that is enough for 650m meals!). These are some horrifying facts and I can only imagine this has got worse - however it looks like things are starting to change. We are seeing supermarkets such as Lidl launching 'waste not' green stickers slashing prices of perishable foods close to the sell by date as well as Iceland teaming up with Tiny Rebel Brewery to produce a beer made from Iceland's leftover bread. 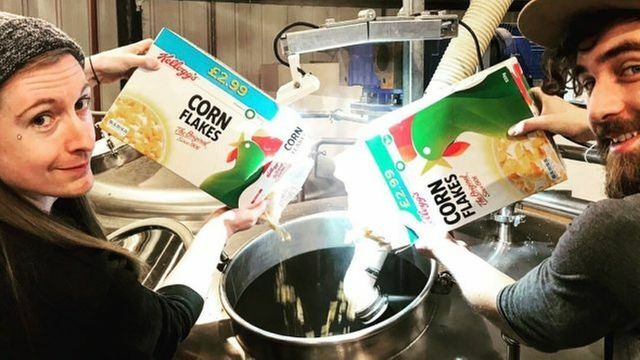 There are more and more clever companies out there coming up with bright ideas to deal with the issue and now the giants that are Brewdog, have teamed up with Seven Bro7hers brewery to bring out a beer made from cornflakes. Yes, you heard right, cornflakes! They are taking the cornflakes that didn't quite meet Kellogg's high standards and turning them into beer! What a brilliant idea this is, and one that is working very well for Toast Ale who do a similar thing with leftover bread. This is just the tip of the iceberg however and I am sure there are many other small SMEs out there that can look to the big blue chips and help the planet as well as fuel their growth! I am eagerly awaiting a mince pie beer next year for Christmas. Come on guys! Food waste is a serious problem. Fortunately there are some very clever folks out there coming up with creative ways to deal with it. Many of those people happen to be brewers. Take, for example, the men and women of Seven Bro7hers and BrewDog over in Manchester. They recently got together with Kellogg’s in the U.K. to help make the company a bit more sustainable.